Broadband light is composed of electromagnetic radiation consisting of multiple wavelengths. Most optical sensors, materials, and coatings exhibit individual characteristics when exposed to different wavelengths of light. In certain applications, these spectral behavior variations become highly important. 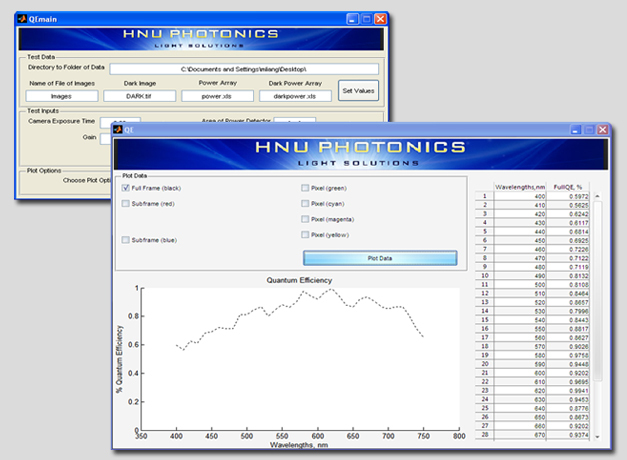 HNU PHOTONICS offers a spectral calibration suite to test your optics over broadband or descrete wavelengths (monochromatic light). With monochromatic illumination, calibrations measure spectral variations with respect to: absolute quantum efficiency, transmission, or reflection. The monochromatic data are then processed to serve as calibration data for field use. With the continued increase in infrared technologies, Hnu has an expanded laboratory suite to perform spectral calibrations in the visible and IR regions. HNU PHOTONICS has the capability to isolate light over extremely narrow wavelength bands (below a single nanometer). This effectively creates monochromatic illumination to test the spectral performance of your product. HNu has developed a graphical user interface for rapid in -house data analysis. This yields quick turn-around times for your needed calibrations. Customer deliverables are exported as spreadsheet files for ease of field use. Quantum Efficiency Calibration can be determined for the average of the entire frame of pixels, any subframe of pixels, and/or any single pixel or every pixel. Read Noisen & Dark Current are standard noise values produced by camera electronics. These values are characterized and provided to help process important image information. 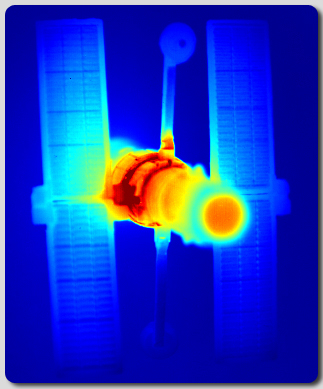 HNu's state-of-the-art laboratory is equipped with NIST traceable instruments to obtain absolute radiometric data. Interchangable equipment allows for quick transitions between spectral regions. Creates monochromatic illumination by seperating discrete wavelengths from broadband light. Programmable automation allows for rapid data acquisition, and external laboratory controls allow for environment stability. NIST tracable power meters are used for absolute radiometric measurements during calibrations.